At a recent in-house PuMP Blueprint Workshop I ran for a client, one of the participants came up to me at the end of the 2 days and admitted that he’d come to the workshop very cynical and expecting to learn nothing new. He quickly went on to say that he experienced just the opposite and gave me a hug to say thanks! If it was always that easy to turn the KPI cynics into KPI advocates, then the world would be a radically different place on account of all of us easily measuring exactly what mattered. But that ain’t the case, is it? There are a few signs that your progress toward the right KPIs is being held up by people feeling cynical about the whole deal. Here are some of the things you might hear them say, and some tips for how to respond in a way that starts their journey toward KPI advocacy. 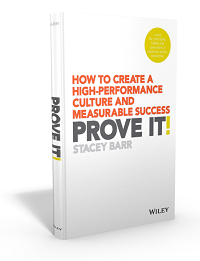 We’ve been doing okay without performance measures in the past, so why start now? The hidden agenda is that management are going to start hitting people over the head with the measures, demanding more from us, and cutting jobs. We have “real work” to do. Listen out for the objections that your managers and colleagues and staff offer up against performance measurement. What assumptions are they making that you can raise, and through some genuine questions, test the validity of? In life we need to be prepared all the time. Just like in war & peace, preparedness for war is the best defence for peace. Hence, as employees, no matter how we dislike change, ‘change’ will be the only constant. Hence, we ourselves need to be proactive and actively participate in preparing ourselves for all kinds of eventualities. The worse thing that can happen to anybody is that they remain static and is overwhelmed with change. Everything will change. If before it was like that, now it is going to be different! So is one going to rest on ones own laurels and be caught unprepared or are we going to prepare ourselves, even before changes occur. Today’s war is won without seeing the enemy! I think I understand your comments on “hitting people over the head with the measures.” But I also hear a follow-up question to your suggested reply: if management doesn’t use the performance measures in my personal evaluation, what will they use to evaluate my contribution to the business? Andrew, I truly agree with your philosophy about change. If we aim to keep performance the same, and think that doing nothing is the way to achieve that, then in actuality performance goes backwards. Nothing can stay the same without effort to battle all the other inevitable changes that impact our performance.